Here is a picture of Tapejara compared to an unknown thalassodromid comparing skull and neck. 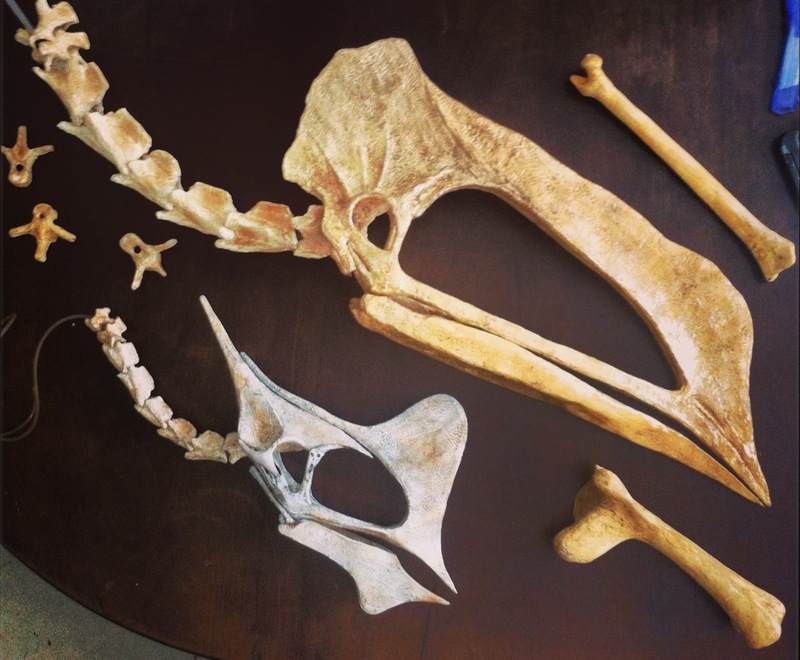 But this post is about the vertebrae that come after the neck: the dorsal vertebrae. 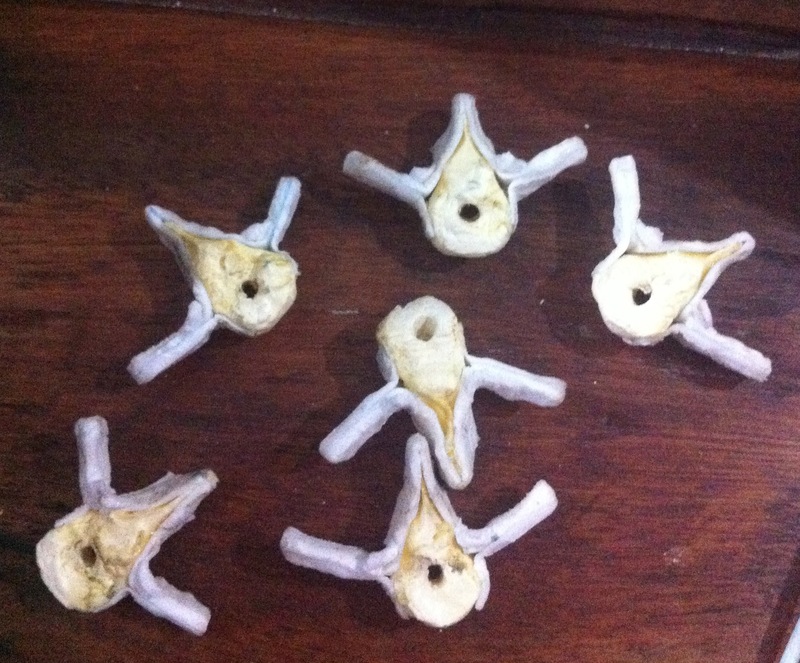 The first four to seven of these vertebrae is fused in most adult pterosaurs to support the pectoral girdle and is called the notarium. There is no fossil evidence that this occurred in Tapejaras, but none of the specimens used are considered “full grown adult” either (I’m referring to the ones that were published). 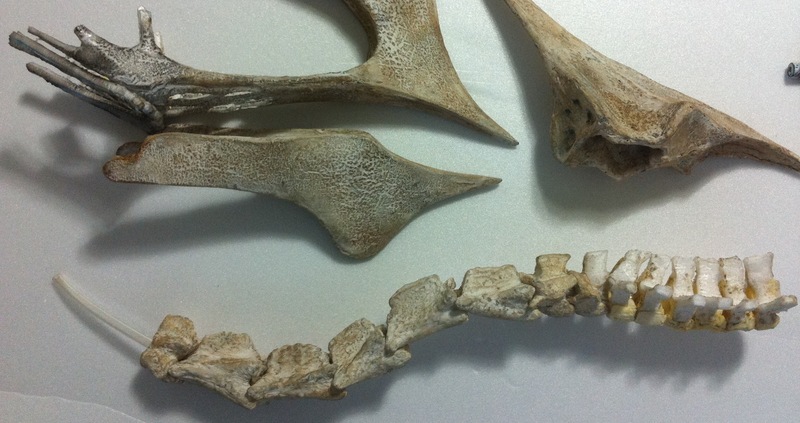 Some decisions that affected the dorsals also involved the cervicals, so I might also talk a bit about them here. I had some trouble with my sources. I used the same ones I had used for the cervicals, but several images published in the article about SMNK PAL 1137 had the wrong scales, so the sizes didn’t match. Not even the reconstructions using the bones from the same specimen matched, and the descriptions confused me more than they helped, so I had to rely on other sources. MN 6588-V has several dorsal vertebra but it’s not really a tapejara, and it also has an incompatible scale: if I match the size of the cervical vertebra in that specimen, all the others become too small. So I decided to trust the scale I was originally using (from IMCF 1061) which unfortunately has no dorsal vertebrae, and to estimate the size based on Tupuxuara. The problem is that Tupuxuara’s cervical vertebrae are proportionally shorter, and so is the pelvis, so maybe the Tapejara has a narrower and longer body than the Tupuxuara, or maybe it just has a proportionally longer neck. I don’t know. I checked other reconstructions (drawings and sculptures), but they seem to either have fewer cervicals, or identical cervicals. 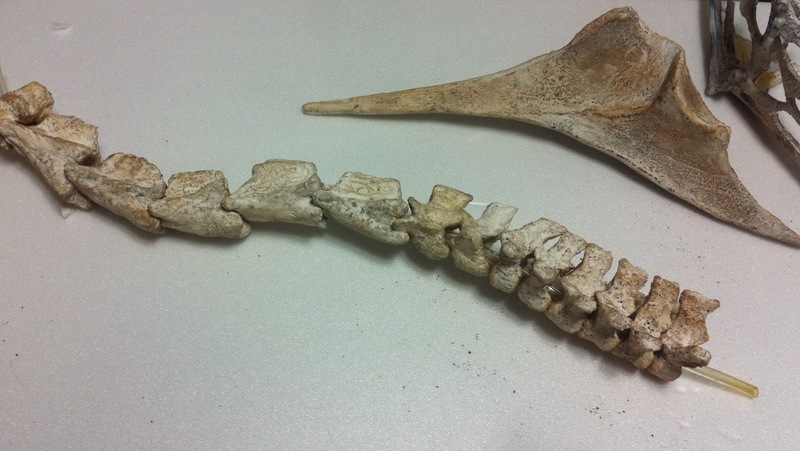 I observed that both in Tupuxuara and Tapejara (Iwaki specimens) there are some longer cervicals and others which are shorter and taller. I am not sure about the order, but in the (unpublished) Iwaki specimen, they were numbered, and the two shorter ones were cervicals no. 3 and 5 (not counting Atlas/Axis). I don’t know how accurate that ordering is since there is no publication, but I assume they either knew before preparation or they fit somehow, and since that’s the best information I have, I followed that same order in Tapejara. I decided to not use any reconstructions as sources except my own. I used the four dorsal vertebrae from SMNK PAL 1137 as sources ignoring their (incorrect) scale, adding broken and missing parts, and tried to fit them with the eighth cervical vertebra, using the Tupuxuara notarium as a reference but making each vertebra a little wider. 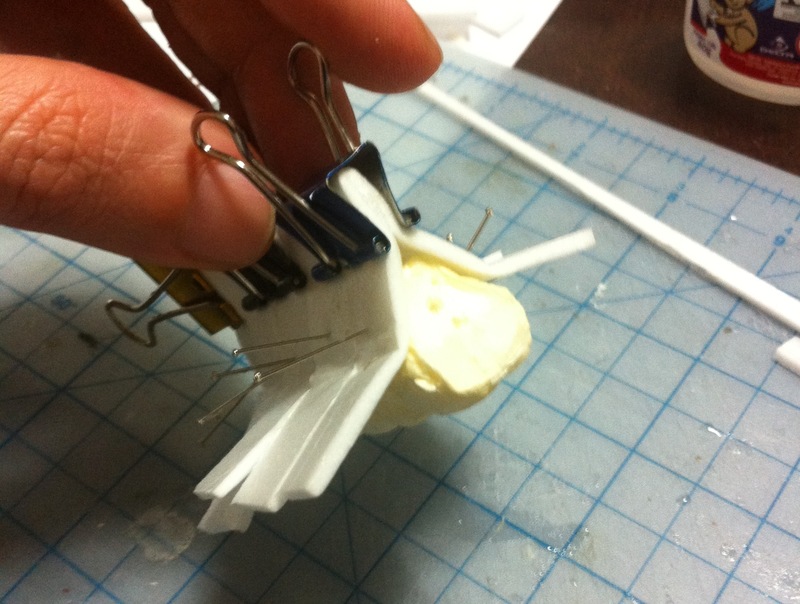 After trying out three different prototypes, I could finally start making a final version. 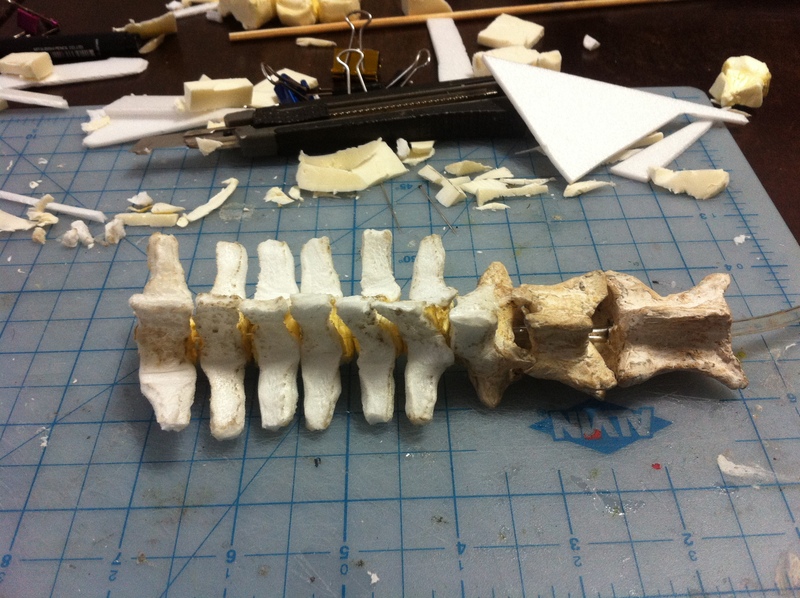 I used foam strips for the processes and thicker foam for the vertebra’s body. 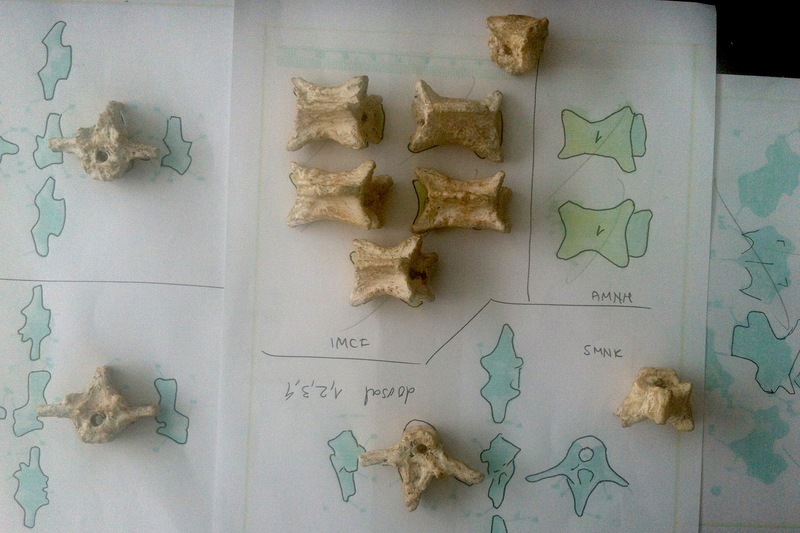 After fitting the processes together, I separated the vertebrae to add details (processes) to each one. 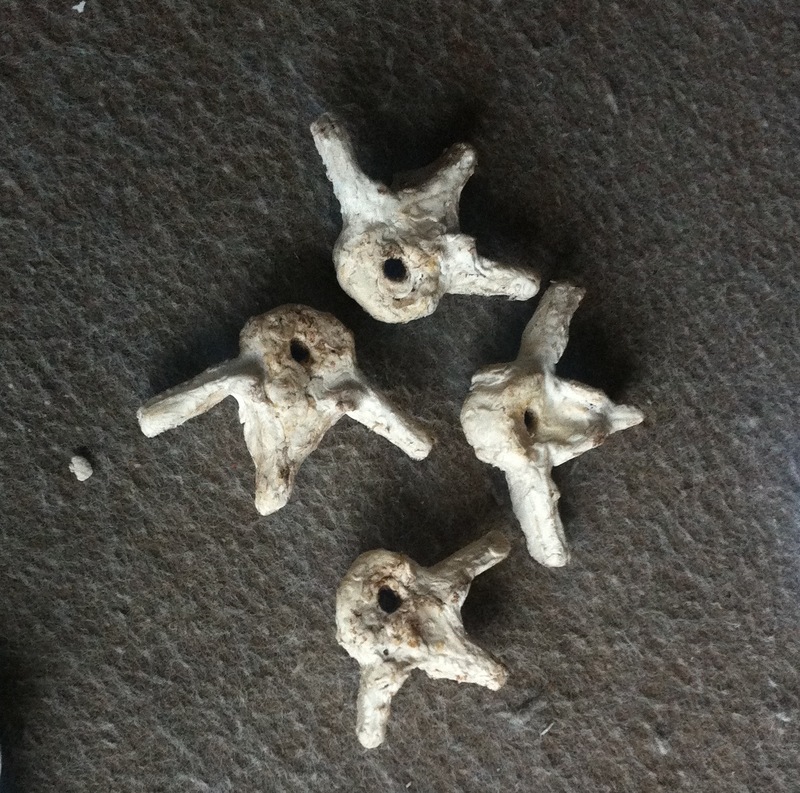 Here are some views of the vertebrae after molding with fire, but before adding modeling resin. And here some more views after resin and staining with coffee. These are the dorsals that are part of the pectoral girdle, and which will articulate with the scapula. The exact number of dorsals after them before the sacrum seems to be unknown. Most reconstructions draw six notarium vertebrae + three to four free ones + two to three pelvic dorsals before the sacrum (that means 5 – 7 more dorsals), but other authors mention 10, 12. It seems that there is not enough evidence to be sure. I am also not sure about their shape. Do they get smaller, narrower, wider? I don’t mind reading dozens of publications. It’s great. They revealed that many of my assumptions were bad theories, but they usually don’t offer me a solution. They open a discussion. And so, the more I read, the harder it is to make decisions, and I also reach the point where paleontologists disagree. It’s a fantastic discussion, really, but I have a deadline, so I have to make some choices. If they are bad, I will try to fix it before I deliver the skeleton. 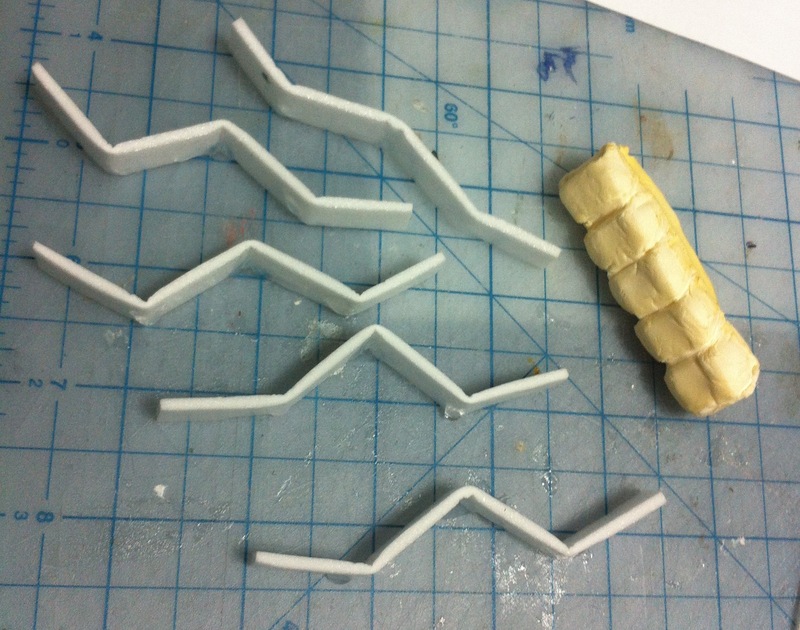 So I decided to make 9 more dorsals (a total of 15). Three will be fused to the pelvic girdle, and the other six will be free. This is a first 3D sketch (the body and the spine of six dorsals). 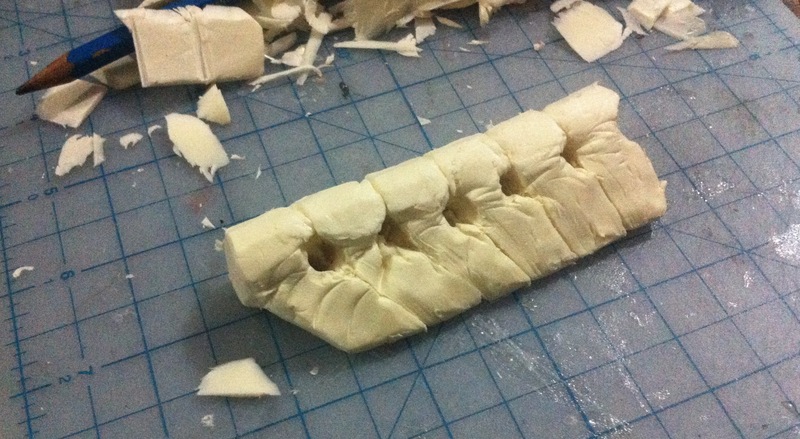 After adding the processes and splitting. After acrylic resin and staining. 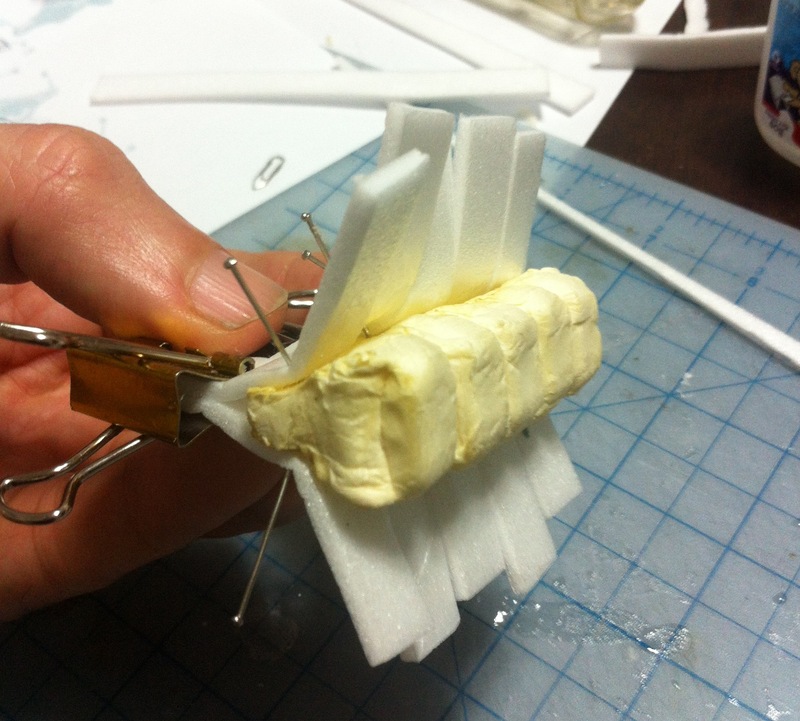 They are not really finished: I’m using them as prototypes so I can continue the work. 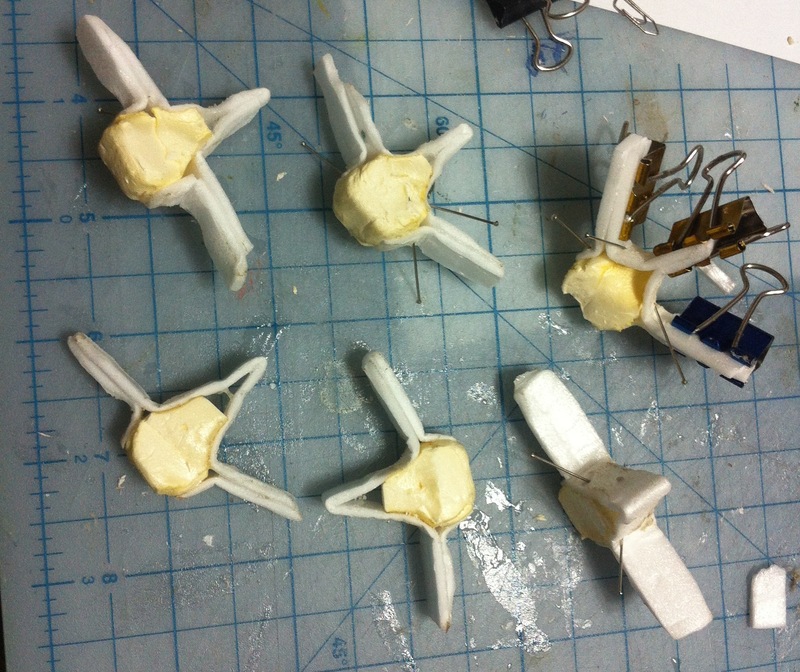 Later I might reshape them, cut some excess foam, make them thinner, narrower, or even throw them away and make new ones. For now they just need to be functional. I’m trying to find reliable information to make the pelvis. The only sources I have are SMNK PAL 1137 (just pelvis, no sacrum, one or two views of each bone and no more), and a side view from MN 6588-V. I would be nice to have other views. I’ve been trying to obtain permission from the Iwaki museum so I can have access to all Tapejara photos (I only have some), but so far I haven’t received any response. I might have to continue without them, unfortunately.